All the basics and more. 1. A broom and dustpan set with an adjustable-height handle — it's best for sweeping up the daily dirt that seems to accumulate in your kitchen throughout the day (or week...or month, depending on how often you end up using it). 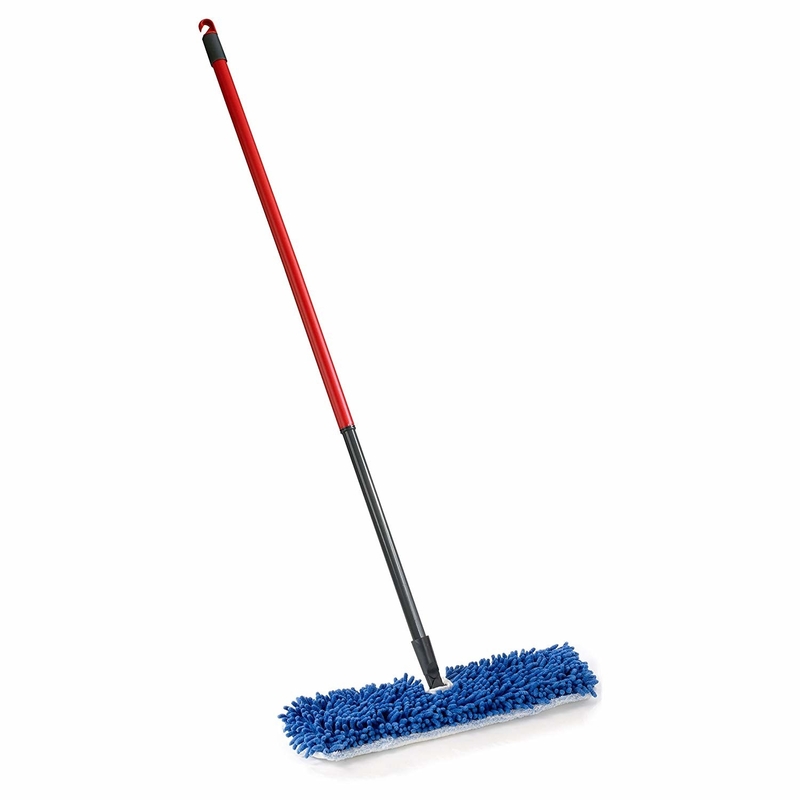 You have to use something to pick up the bits of pasta, strands of hair, and buildup general dust that afflict your kitchen floors — and some would argue that a broom and dustpan like this is your best bet. The dustpan features a row of useful teeth to help extract any debris that the broom won't let go of, so you don't have to bend down and mess with the broom when it stubbornly grabs a clump of hair. Get it on Amazon for $32.99. 2. 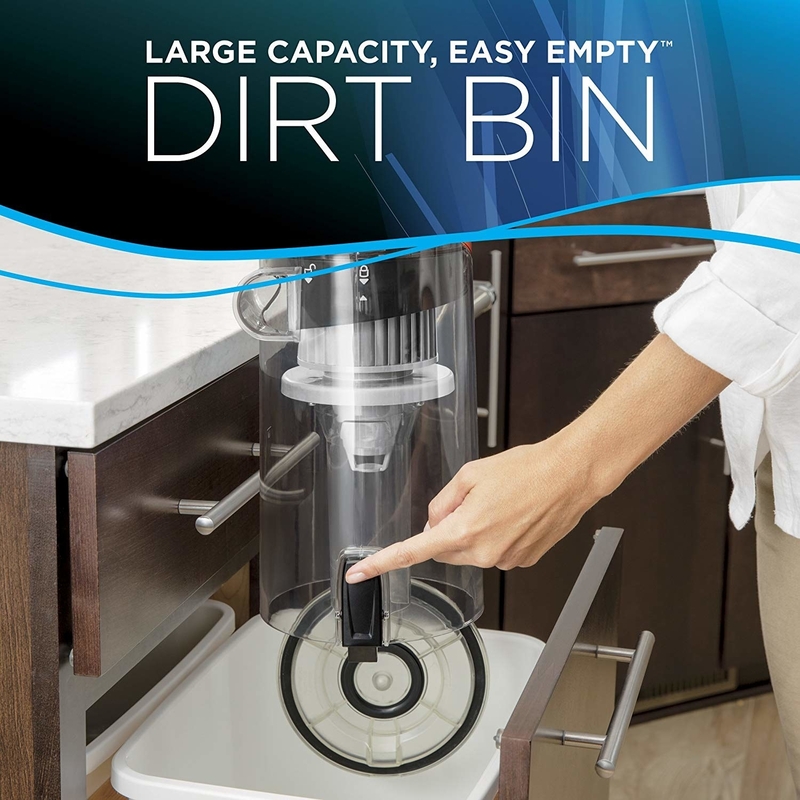 And a handheld broom and dustpan that hook together for simple storage because sometimes you just spill a *little* bit and don't feel like pulling out the big set. The brush easily snaps into the handle for easy storage, too! Promising reviews: "Such a simple concept. It's difficult finding the perfect dustpan yet this is it. The brush has an angled tip that gets into corners... genius! 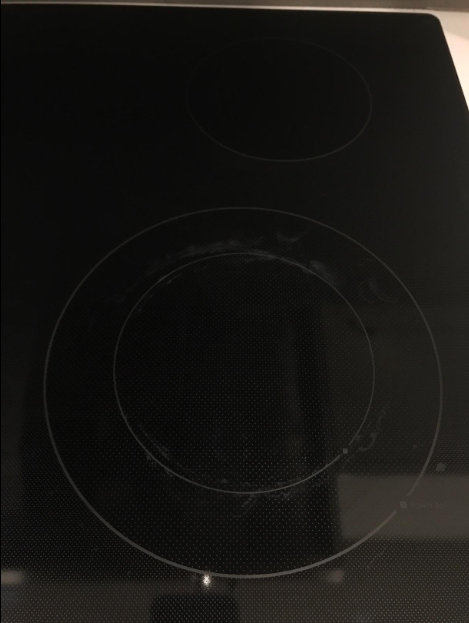 The best part is the small strip of rubber that edges the pan, actually lays flat, unlike countless other brands I've tried. I am no longer chasing crumbs around the floor." —L. Get the set on Amazon for $8.99. 3. 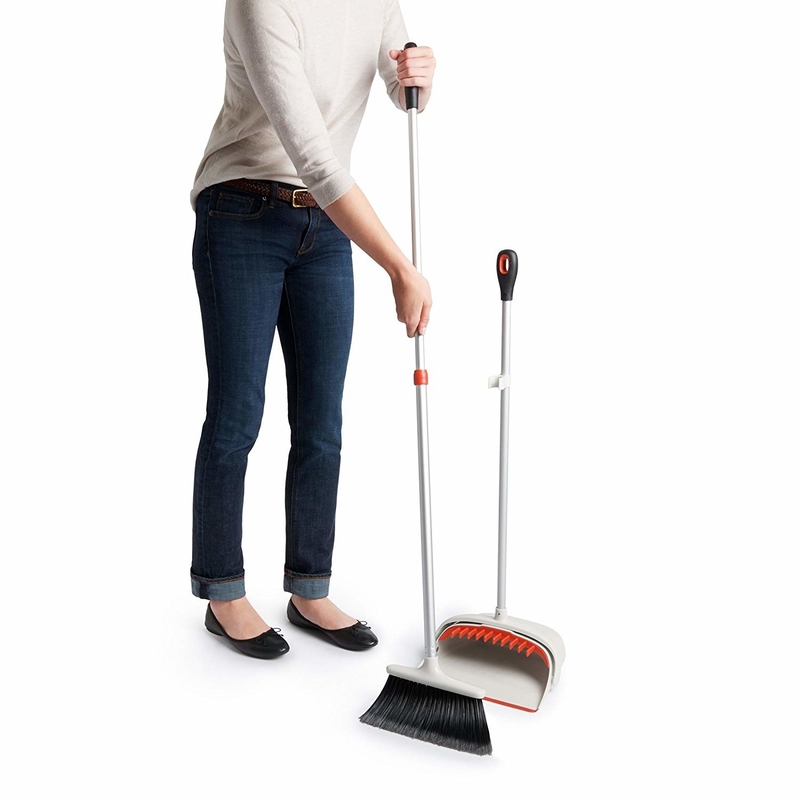 A telescoping microfiber flip mop, if you have wood, tile, laminate, or linoleum floors. The blue side picks up some dirt, dust, and hair (completely dry), then the white side uses just water to wipe up even more stubborn gunk. 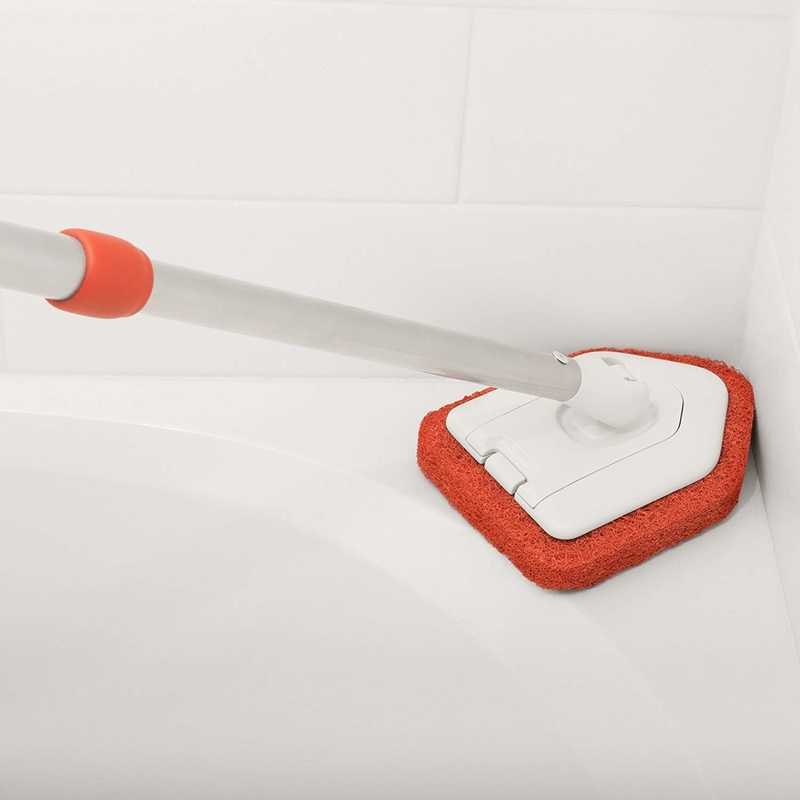 I own and love an earlier version of this flip mop (it doesn't have the adjustable handle) — I bought it over three years ago, use it once or twice a month (in my tiny New York apartment), and the two washable pads I have are still in pretty good shape. To easily wet the floor, I use a spray bottle filled with water (or on wood, I like Bona because it makes the floor feel soft; that's $7.97 on Amazon). Get it on Amazon for $19.96. 4. A powerful but inexpensive vacuum cleaner if you have any carpet or area rugs at all and don't already own a vacuum. Is there a perfect vacuum? Probably not, but this one has lots of great reviews, passes Fakespot, and is under $100, so I bet it's pretty good! 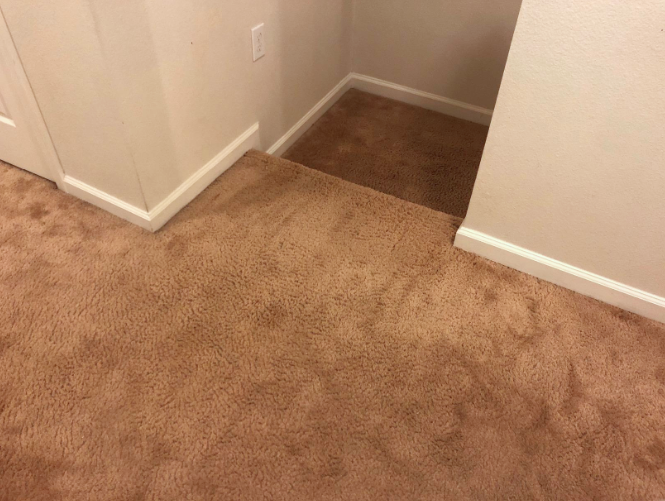 Plus it'll do an even better job on wood, tile, and other hard floors than a broom or dust mop would — and with less effort. 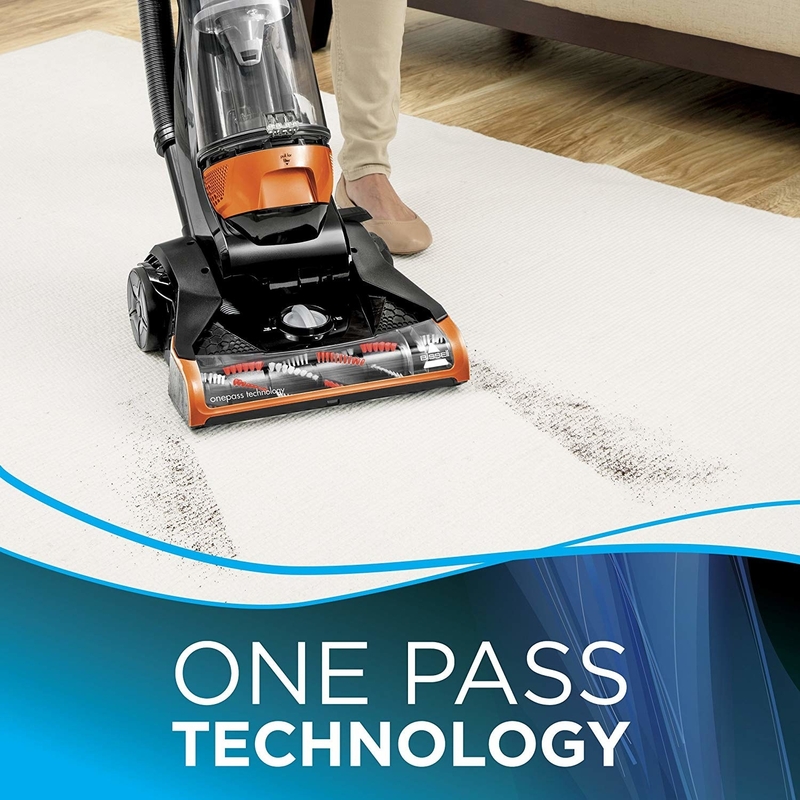 (I personally use and like the Miele Turbo Team, which I've had for almost two years now, but at $319.20 I wouldn't necessarily call it a starter vacuum). Get it on Amazon for $74.99. 5. A spray bottle filled with your choice of all-purpose cleaner and a pack of reusable microfiber cloths, so you can go to town wiping down each and every surface that's even the littlest bit dusty or dirty. You could also use an old cotton t-shirt (cut out rectangular rags if you feel inspired) or a simple cotton washcloth and your house would likely be just as clean! But microfiber cloths will hold up wash after wash, won't leave lint or streaks behind, and will help remove dirt and grime with less elbow grease on your part. Get a pack of eight for $16.99, and three bottles of a lovely lavender all-purpose cleaner for $22.99, both on Amazon. 6. A fume-free oven cleaner that will erase the evidence of all those years of delicious baked goods (or, y'know, frozen pizzas and bacon) overnight. Get it on Amazon for $4.97 (as an add-on). 7. 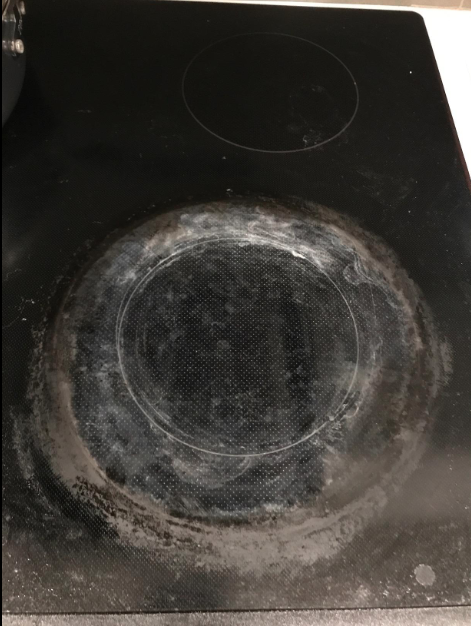 A glass cooktop cleaning kit packed with everything you need to shine up even the messiest burner so it gleams like it did the day you moved in. Get the kit on Amazon for $9.99. 8. A bottle of BarKeeper's Friend because it can make so many things in your kitchen look brand new again: stained pots and pans, dull and scratched ceramic sinks, cooked-on grime on gas cooktops, tarnished shiny metal, rusty-looking stainless steel, and more. If that transformation doesn't convince you, just take a gander at the rest of the Amazon review photos — you'll see what I mean! Get two bottles on Amazon for $8.60. 9. 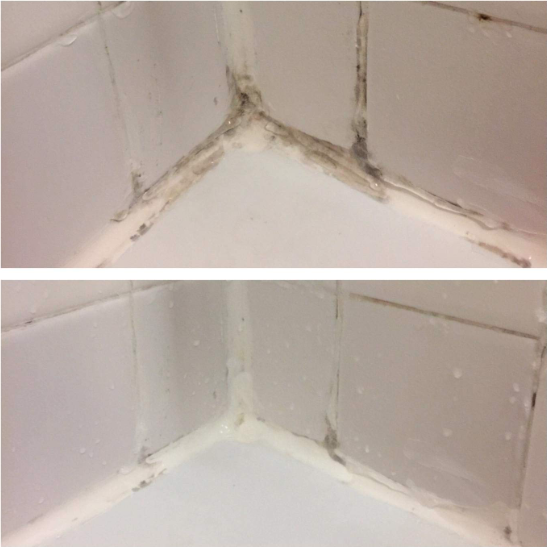 A bottle of no-odor gel mold and mildew cleaner that sticks to your tile grout and caulking, giving it the time it needs to do its job: banishing the grossness like it was never there. Promising review: "Wow! I would give this 10 stars if I could. 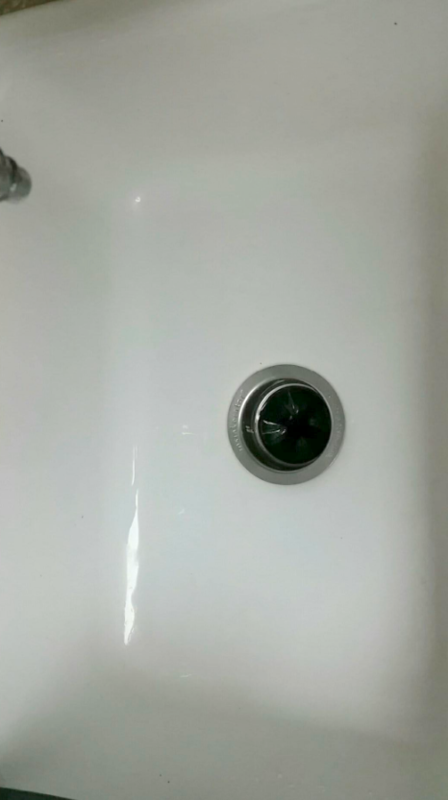 We've had issues for a few years with the caulking behind the handle of our kitchen faucet turning black from mildew. 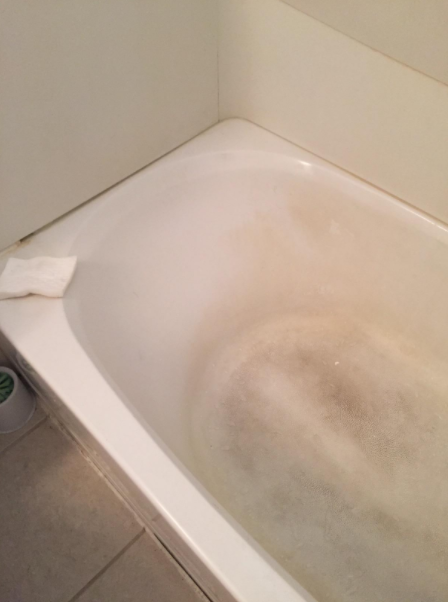 We've scrubbed with what seems like a million different products, with no luck. We were actually just talking about ripping out the caulking and doing a total replacement. But, my husband saw this online the other day and decided to order it. Almost immediately when he applied it, you could see it was starting to work. We left it on overnight and the black is COMPLETELY GONE! It's incredible. 1000% worth the (small) investment." —Nicole D.
Get it on Amazon for $12.99. 10. 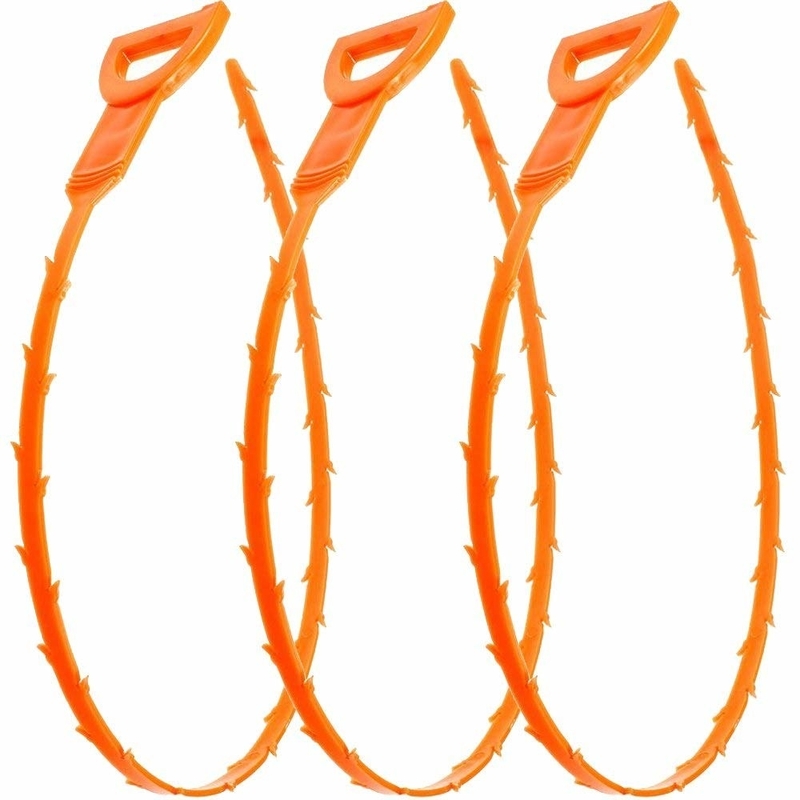 A pack of three disposable drain snakes to reach deep into your pipes and pull up that slimy hair monster who's been viciously blocking your tub and sink from draining freely. Get a pack of three on Amazon for $5.99. 11. 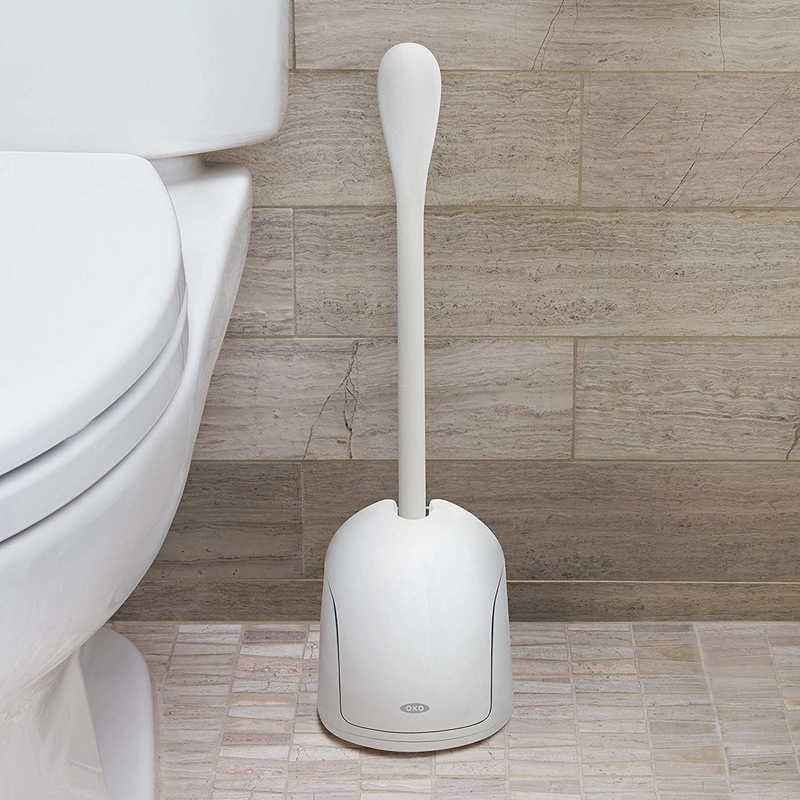 A high-quality toilet brush because if you don't own one already...well, they're the easiest way to keep your commode from getting gross. The canister this comes with opens automatically when you lift up the brush, then closes when you set the brush back down. 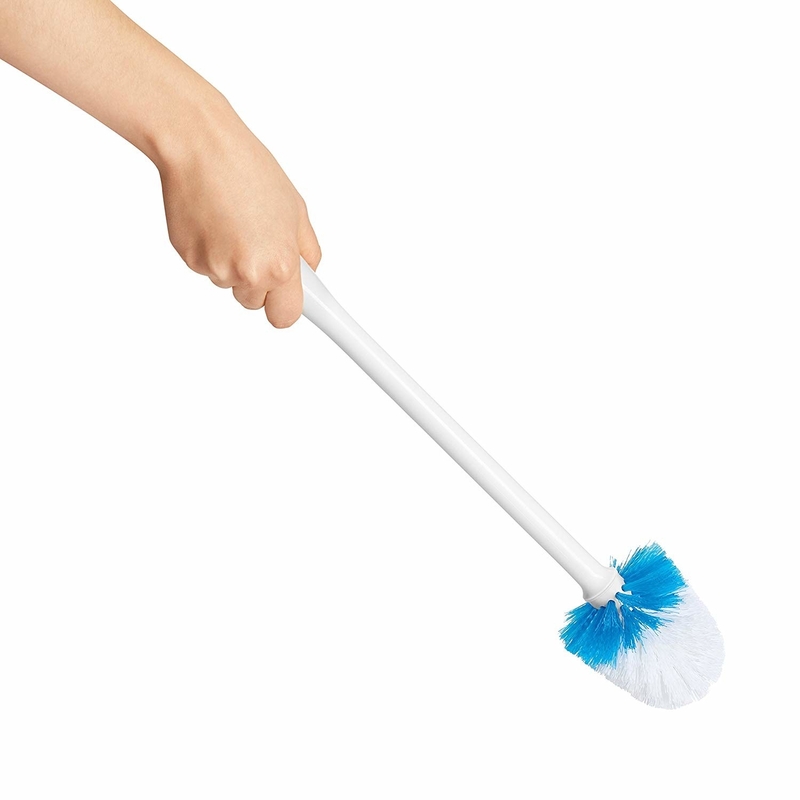 Use it with a toilet cleaner ($3.72 on Amazon), and after you're done scrubbing, trap the brush under the seat so it can drip-dry into the toilet, before you put it back in the canister. Get it on Amazon for $15.95+ (five colors). 12. 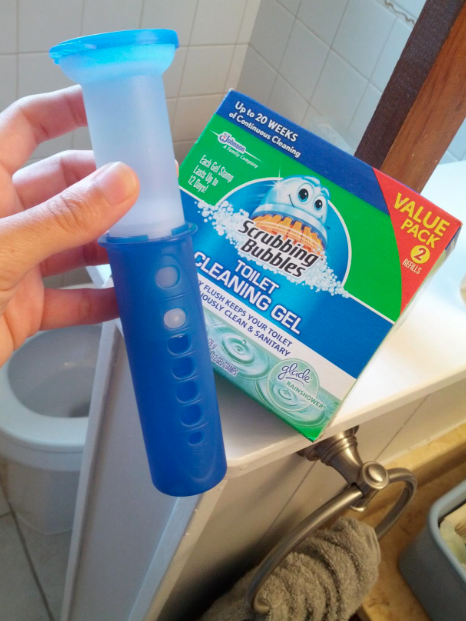 And a stamp-in gel — after your toilet's clean, this will KEEP it clean, no need to scrub on a regular basis. Just press it beneath the rim and let it do all the work. Promising review: "These are amazing and I'm bummed I haven't tried them until now! 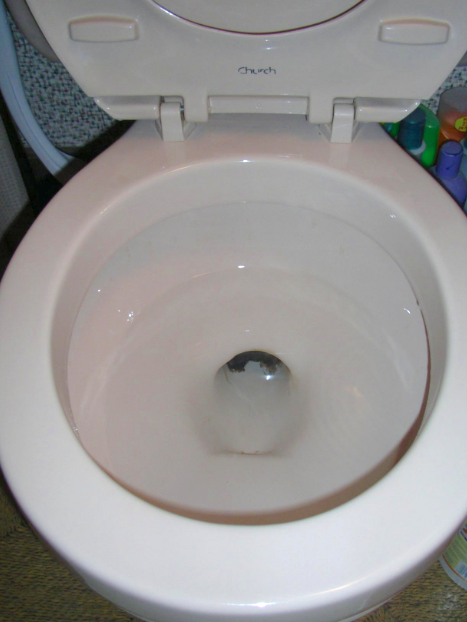 Warning: possible TMI ahead! Get a pack that lasts for 20 weeks on Amazon for $6.54. 13. Oh, and a pumice stone scrubber to tackle built-up hard water stains no toilet brush could hope to stand a chance against. You just wet the stone a little, then scrub away to watch it work its magic! Get one on Amazon for $7.99. 14. 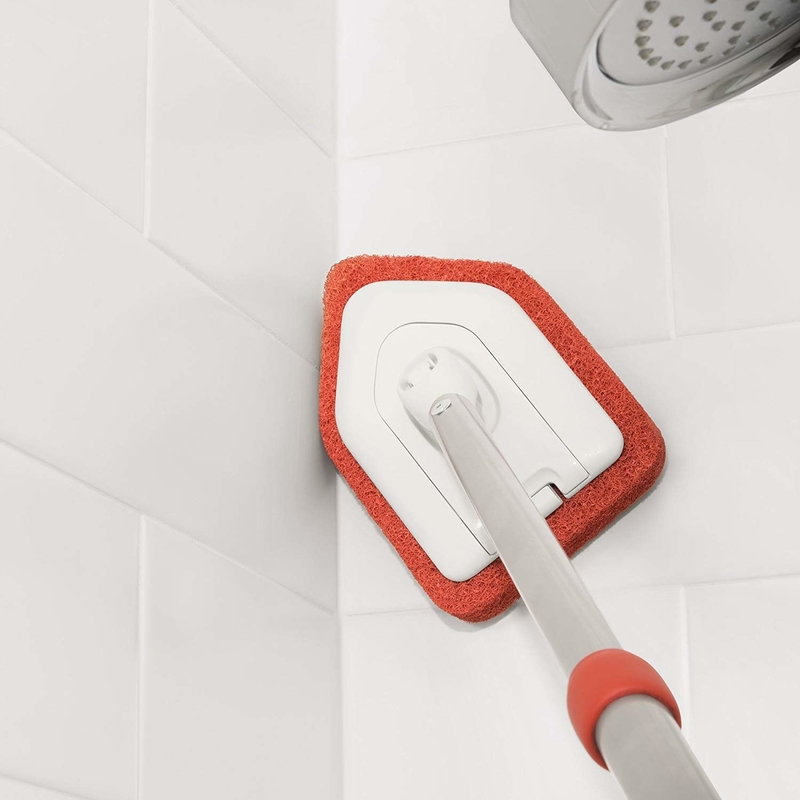 A telescoping tile scrubber so you can reach all the corners of your bathroom without teetering on the edge of your tub. 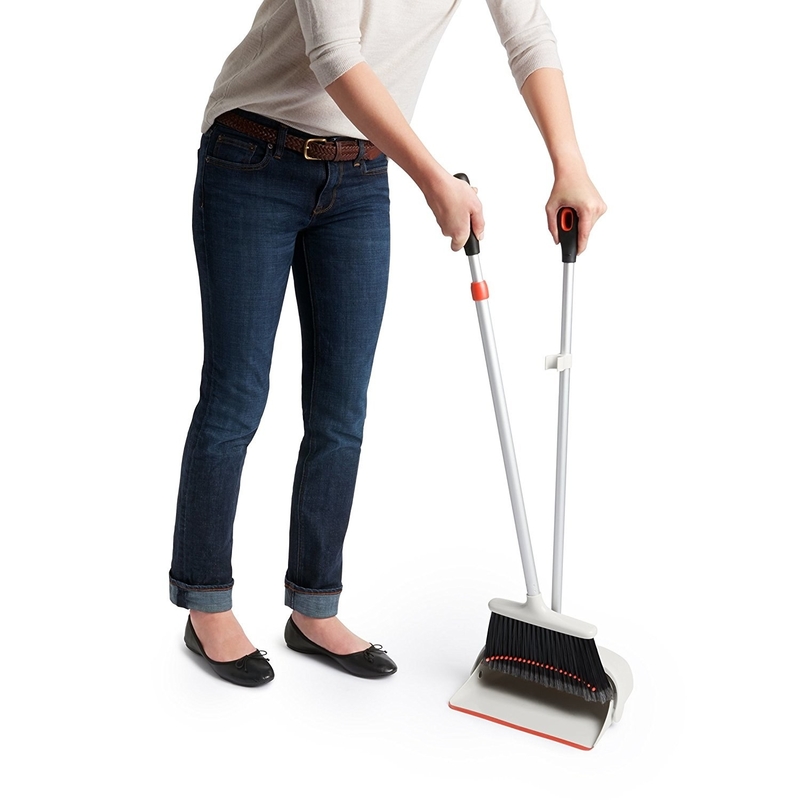 The handle extends from 26 inches to a full 42 inches, letting your feet stay planted on solid earth. 15. 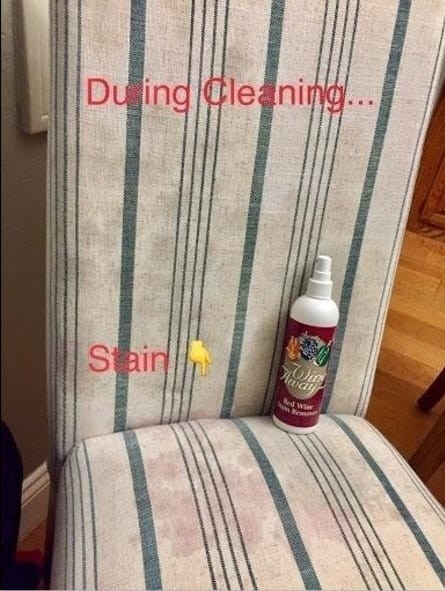 A carpet and upholstery stain remover so you can extract all kinds of dirt, rust, grease, food, and other stains that you haven't been able to get out using literally anything else. ^^ That's ketchup pictured above, just FYI. 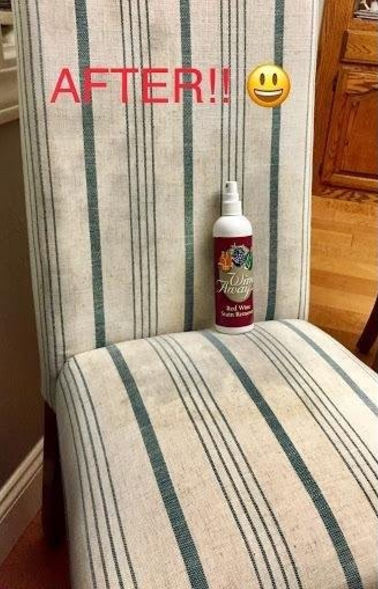 It works on all kinds of upholstery, carpet, and other color-fast materials that are safe to dampen with water. Get a bottle on Amazon for $13.34. 16. 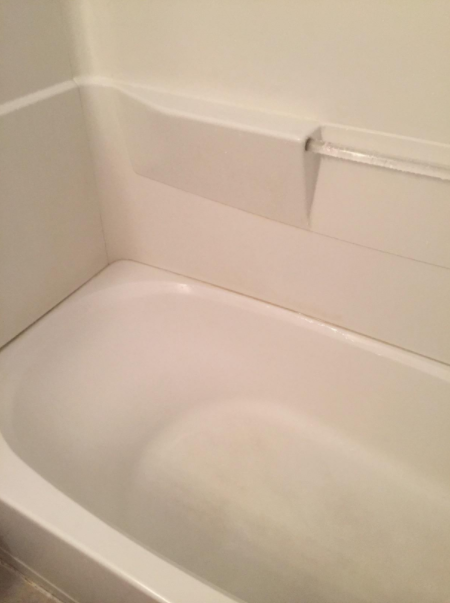 A soft cleanser that, with very little elbow grease, will eliminate years of built-up hard water stains on tile or glass, truly transforming your shower right before your eyes. Get a bottle on Amazon for $7.62. 17. 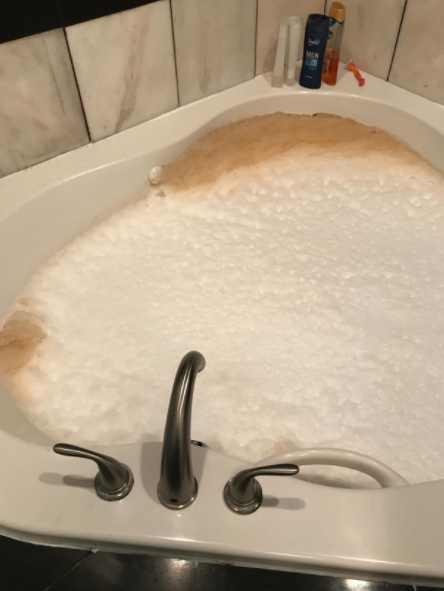 A pack of Magic Eraser bath scrubbers so you can scrub out every last bit of grime and soap scum from your tub and still have energy left to keep cleaning — or just enjoy life! — when you're done. These bath scrubbers are like an ~upgraded~ version of the classic Magic Erasers: they're infused with a water-activated foaming cleanser that makes the job of scrubbing soap scum even easier. Get two packs on Amazon for $11.48. 18. 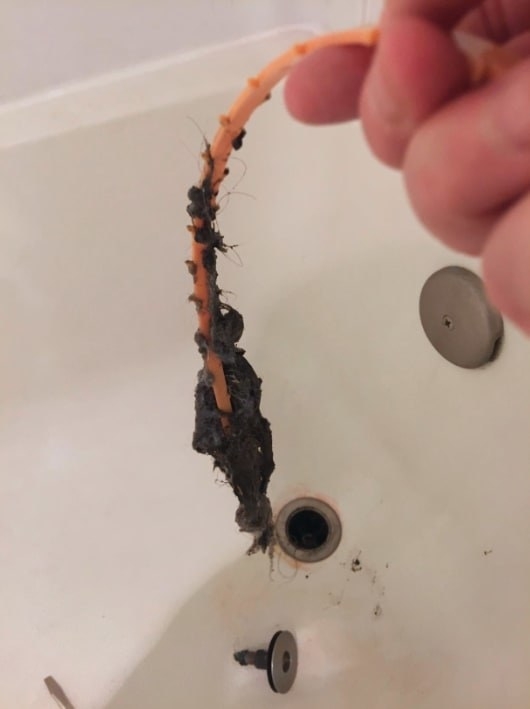 And if you happen to have a jetted or hot tub: a cleaner scientifically engineered to eradicate the years of grimy buildup you didn't even realize was lurking in the pipes. Get a bottle on Amazon for $16.99. 19. 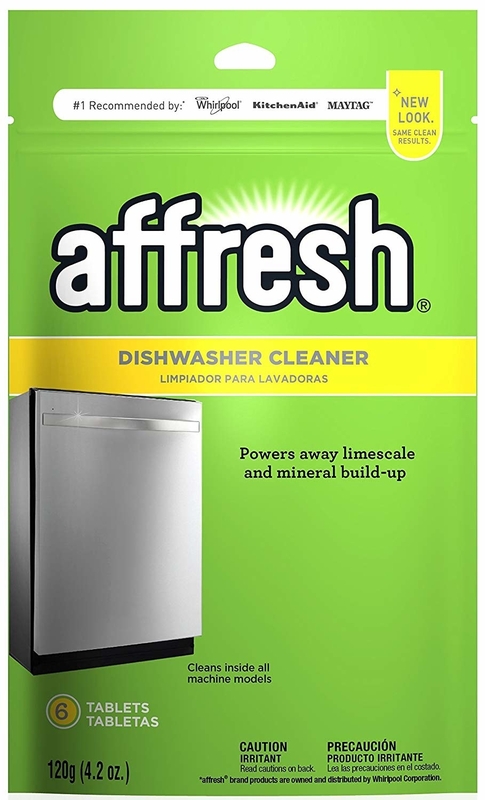 A pack of six dishwasher tablets — running even just one will eliminate any buildup in your dishwasher *and* those stains it keeps leaving on your clean dishes. Get it on Amazon for $5.38. 20. 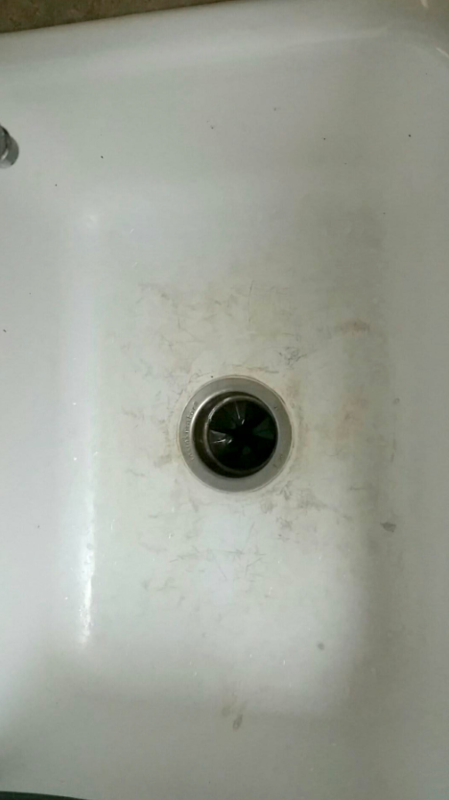 A daily granite cleaner to shine up any stone countertops you happen to have around your home, because some all-purpose cleaners (and anything with vinegar in it) can etch and damage the finish. Get two bottles on Amazon for $15.98. 21. 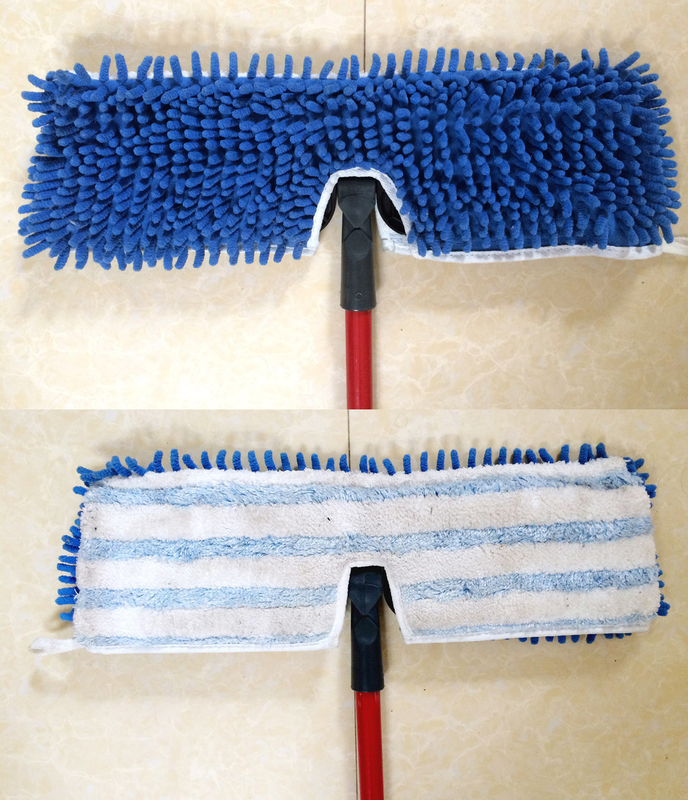 An extendable microfiber duster that will help you reach your highest ceiling fans and the tops of cabinets without lugging out the ladder or pushing chairs around. Its three expanding sections reach up to 64 inches — that's 5 feet! — so basically nothing will be out of your reach. 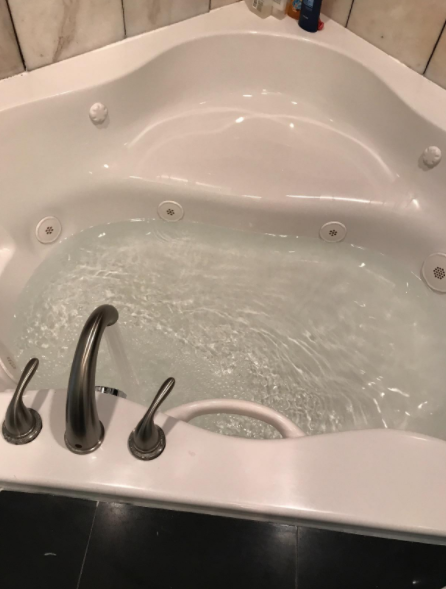 You simply rinse the microfiber head clean when you're done using it (one reviewer suggests spinning it between your hands after it's dry, to fluff everything back out), plus the entire thing folds in half for easy storage. And its fluffy dusting head collapses easily to reach into small nooks and crannies. Promising review: "I'm not a neat freak so I never thought I'd be saying I love a duster, but when I use this I feel like it's one of the best things I've ever bought. I'm only 5'2" tall so I need the extra length even though I don't have high ceilings. 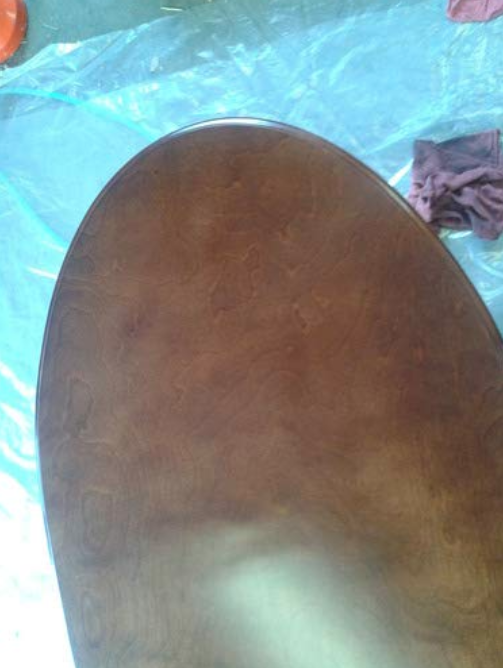 It's nice to be able to use it at different angles as well as bend the duster part itself. Plus it's really easy to adjust. 22. 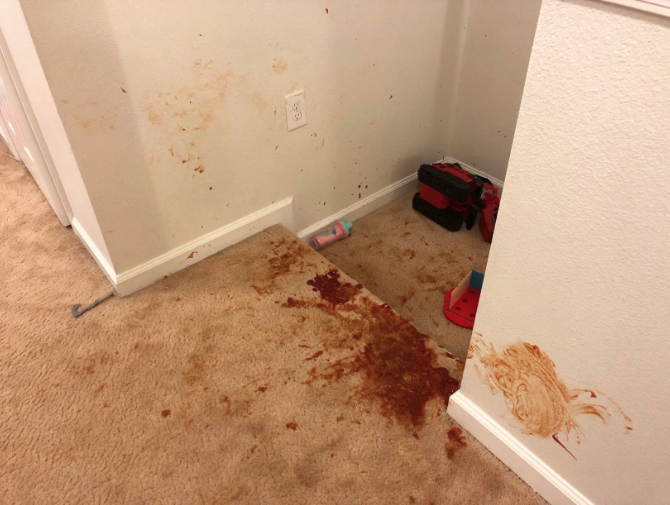 A bottle of Goo Gone is essential anytime you have to tackle mysterious sticky substances like tape residue, old stickers (including bumper stickers), glue stains, and dried bits of that slime kids love so much. Promising reviews: "This stuff is amazing. So far, I have used it to remove heavy adhesive from a tile floor where we had previously had an adhesive cover for a wire running across the area. 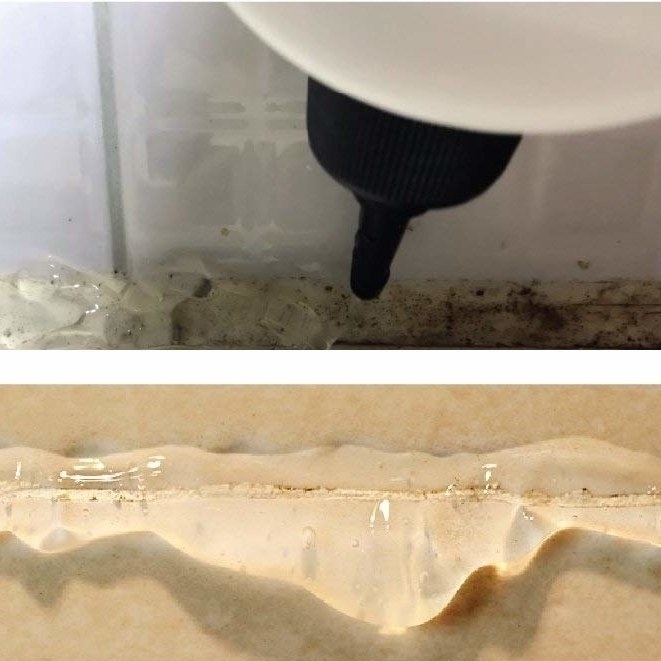 I applied Goo Gone, scraped the majority of the adhesive and fibers off, then wiped off the remaining residue with a paper towel. Get a bottle on Amazon for $7.88. 23. A finish restorer designed to eliminate heat rings, water marks, scratches, color fade, oxidation, and more from your favorite wood furniture — even on your wood kitchen cabinets. 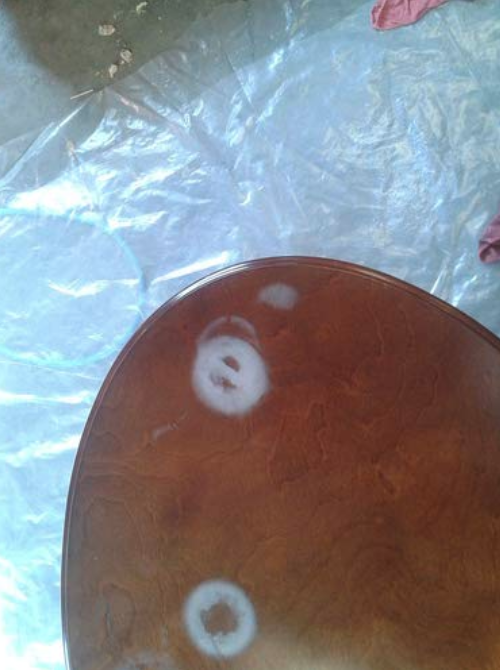 For minor stains and discoloration, it's a simple wipe-on, wipe-off process you can do in just a couple of minutes. 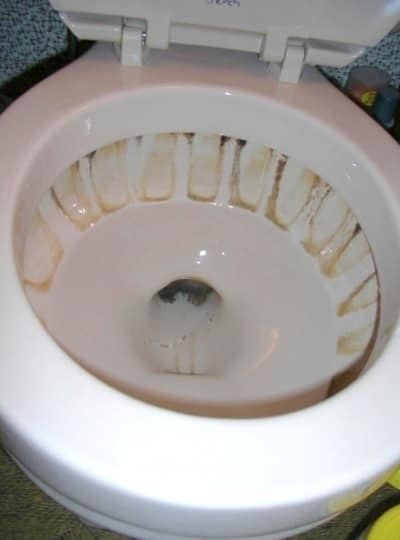 You may have to put more time and effort into worse cases (like the one pictured above), but reviewers swear it's worth the work. Get a bottle on Amazon for $9.98 (nine colors). For a finishing step, you can also add on the same brand's polish and conditioner, $9.89 on Amazon. 24. A wine stain remover that will make even dried, set-in spills vanish completely after just a spritz or two. Get a bottle on Amazon for $5.92. Now go forth and make your entire home sparkle! 24 Cleaning Hacks That'll Make You Say, "Why Didn't I Know About These Sooner?"